Oh Saturday, my warm Saturday, how must I love thee? It’s August, and there was no friggin way I was going to spend the day indoors. I had a sudden yen for oysters and while I could’ve gone to The Oyster Bar, it wasn’t happy hour yet. I thought I’d kill two birds with one stone by checking out two direct competitors on Fisherman’s Wharf by the Inner Harbour. But first, I had to hit the Beacon Drive-In just to see how this place fares with its meals. They’re more well known for their soft-serve ice cream and that’s going to be tough to beat. The various flavours they offer and the speed they churn out the product is to be commended. Over the years, they’ve found an effective method to keep the crowds coming in, and for those who want a bite, streamline their service. They announce through a speaker system which tills are “customer-free” throughout the day. For whoever can make the mad dash to it, they can be served first. There was no combo savings for my order—an oyster burger, regular sized fries and coke—and as a late lunch, the value seemed reasonable ($11.95). The burger itself was $6.95. But in what I ate, it really wasn’t anything spectacular. This establishment uses medium sized oysters and very light dressing for their burger. I liked the idea of using a pickle to help add flavour to it, but it wasn’t a very good crunchy one. It was obviously limp, and I’ve yet to see a stiff one that can make the grade. The fries were decent and this place didn’t go overboard in serving size. After the mandatory must have ice-cream, I was happy. But there was an emptiness in me that needed filling. Was I missing not having my partner-in-crime, either James or Janine (who were at busy at the time), to help evaluate this place or was it simply my stomach still screaming, “Feed me!” No Seymour, I’m not addressing you. 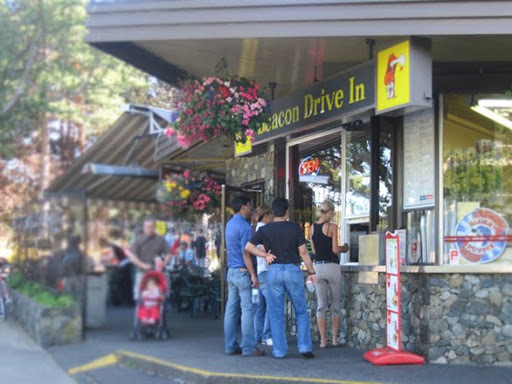 James and I did speak about hitting Beacon Drive-In together, but when I was hungry like a wolf—I just couldn’t wait. We also considered going to Barb’s Fish n’ Chips together too, but today, I just let the thrill of the hunt guide me. That’s a problem when the lone wolf in me wants to come out. I was on the prowl and when I arrived, I saw that the lineups were small. I circled the venue, but was lured away when my sharp nose sniffed out something else at the Fish Store. The seafood choices offered here ranged from buying a bundle to take home to BBQ up, or I could go aww shucks for a buck. This place started offering this deal in July, and I counted my funds to see how much I could grab. 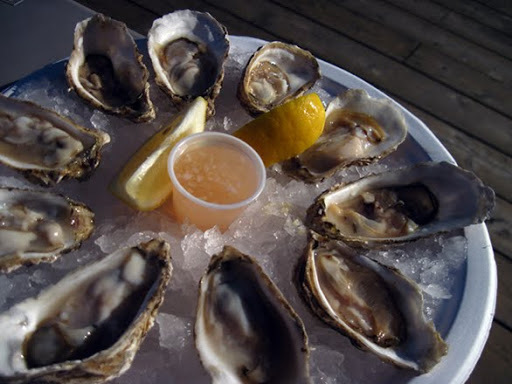 I purchased 10 ($11.20) so I could get a taste of the real west coast—these oysters came from Effingham Inlet. I have to describe what I consumed to have the bright flavour of iceburg lettuce. The ginger mignonette made me think of baby cucumbers, and that was one of the most freshest sauces I’ve ever tasted. It made my tastebuds spring alive and I’m still salivating over the wonderful fresh taste of these medium sized morsels. If this place offered the large sized pieces in the half-shell, I’d be drooling. After a walk around Fisherman’s Wharf Park, hoping a time warp would take me to San Francisco, there was no luck. Instead, I finally decided to enter the long line up at Barb’s. When considering that the watch was indicating suppertime, I’m not surprised that the lull I saw earlier would soon be replaced with a twenty person pile-up. Amazingly, the wait took only 10 minutes for me to finally get to the till and a little over 12 for the order to be ready. Their version was basically a variation of a po’ boy sandwich, stacked with plenty of lettuce, a few slices of tomato and a good drizzle of sauce. The bun was fluffy and the oysters were plump Fanny Bays. These molluscs were very enjoyable when crisped up in their trademark batter. In what I didn’t enjoy were the fries. When considering one of Barb’s website sponsors is McCain’s, I’m not surprised. I gave up on them a long time ago. While Barb’s is praised for great seafood, I’m finding that their land loving cousins’ potato products are not. After five pieces, I was considering using them to feed the seagulls than my own stomach. But there’s a sign saying don’t feed the wildlife, so I wrapped them up and took them away. Maybe I can use them to feed the ducks at Beacon hill instead. Some duck pâté would be nice to go along with the ciabatta I bought from Wildfire earlier that day. 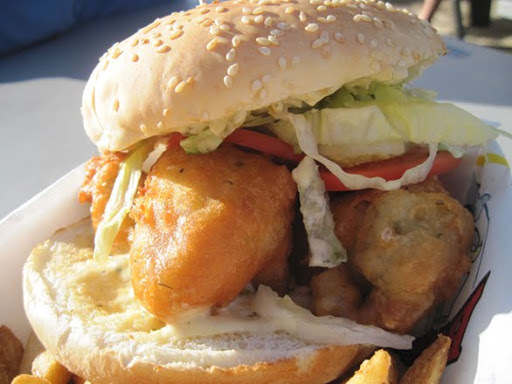 This entry was posted in Food, Reviews and tagged Best of, Breakfast, Dinner, Lunch, Seafood. Bookmark the permalink.